[USPRwire, Wed Apr 07 2010] Goodwill Ambassador, Shin Koyamada attends the 2010 National Cherry Blossom Festival Parade and the 50th annual Japanese Street Festival (Sakura Matsuri) in Washington DC. It is the largest one-day exhibition of Japanese culture in the United States. Sponsored by the Japan-America Society of Washington DC, Sakura Matsuri is centered at 12th Street and Pennsylvania Avenue NW, with easy access from the Metro Federal Triangle stop and Metro Center. Japanese food and beer, sake, music and dance, arts and crafts, anime and manga, taiko drums, samurai swordsmen, ikebana and bonsai, karate, judo, sumo, aikido, sudoku. No matter what, if it’s Japanese, it’s at the Sakura Matsuri. Now in its 50th year, Sakura Matsuri stretches for six square blocks through downtown DC. It takes place on Saturday, April 10, 2010 from 11:00 am to 6:00 pm, right after the Parade of the National Cherry Blossom Festival. “I believe that it is significant to exchange and promote Japanese cultures internationally with the international festival visitors and celebrate Japan America relations. I am truly looking forward to working with the organizers and the promoters and supporting the events in any way I can.” Koyamada says. “Last year the Sakura Matsuri drew over 160,000 visitors” said Ambassador John R. Malott, the society’s President and CEO. The Japanese Street Festival began just four years after the Society’s founding as a small “friends and family” bazaar. Today, it is the largest one-day display of Japanese culture in the nation. Held each April as the climax of the National Cherry Blossom Festival, it stretches for six blocks through downtown Washington. The National Cherry Blossom Festival is an annual two-week event that celebrates springtime in Washington, DC as well as the 1912 gift of the cherry blossom trees and the enduring friendship between the people of the United States and Japan. Shin Koyamada became an international sensation and a new Hollywood rising celebrity after his co-starring role of Nobutada, alongside Tom Cruise in Warner Bros. Pictures action epic The Last Samurai. His star power was further cemented with his starring role in the Disney Channel action-adventure original movie series Wendy Wu: Homecoming Warrior, which was one of the top rated Disney Channel original movies ever, securing over 5.7 million viewers during its American premiere on US television. The film also received the highest rating in the history of Disney Channel Japan as well as broke records in the United Kingdom and Europe, making the Disney Channel the highest rated kids channel in Europe. 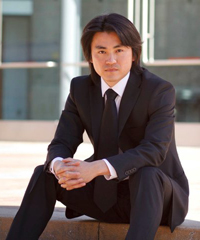 Koyamada is also the co-founder of The Shin Koyamada Foundation, a United States nonprofit organization geared toward empowering youth to achieve their goals and dreams, and to save the Earth. In February 2010, Shin was appointed an International Goodwill Ambassador of the Government of Okayama Prefecture, Japan to promote Okayama Prefecture and Japan internationally.